You’re sunshine on cloudy day. 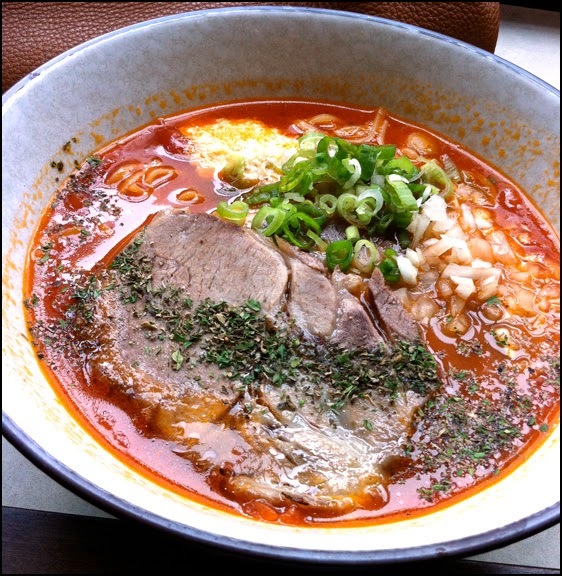 As a ramen shop, when you can elevate the flavour and execution of your Cha-su or protein, people in Vancouver will buzz about you. Santouka’s toroniku and Marutama’s marinated egg helped create a buzz that lifted these two into the top tier of ramen purveyors in the city. I think newly open Taishoken, near the corner of Abbott and Pender, can do the same with its pork belly cha-su. 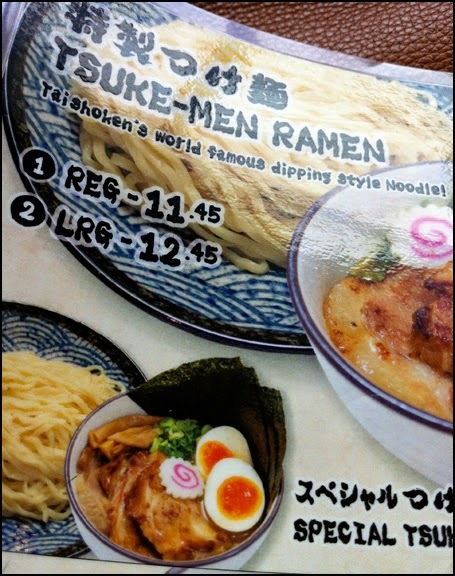 Taishoken is a Japanese based chain that claims to have invented the Tsuke-Men, a.k.a. dipping ramen. When I arrived at this modest size eatery, they were not ready to offer their Tsuke-Men yet. Although disappointed, even by having the special shio ramen I got good sense how the Tsuke-Men will go. 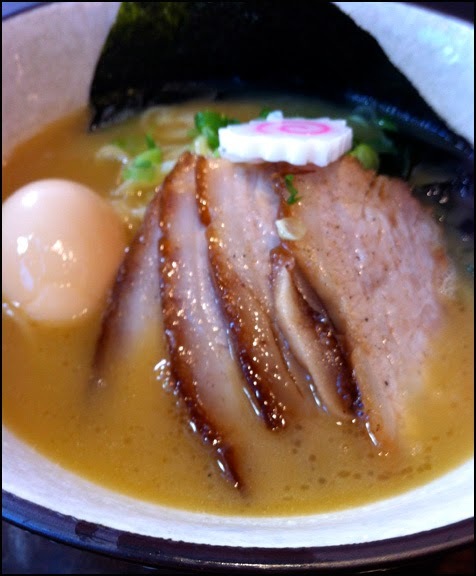 My special shio ramen came with a whole marinated egg, 4 slices of pork belly cha-su, seaweed and nori. The difference between regular and special is the special comes with an egg and I think 2 more slices of meat. For all ramen on the menu, you get a choice between pork belly cha-su and pork shoulder cha-su (for you health conscious types). Overall, the portion of noodle is on the smaller side but in line with other top ramen shops like Santouka. The noodles had a nice chewy consistency. The egg was subpar; not very flavourful and past soft boiled but not reaching green rimmed hard-boiled. As a result, it was a little chalky for my liking. The Pork Belly cha-su on the other hand was phenomenal! Each slice had tender pork alternating between succulent layers fat. The cut of meat was seasoned well with the top and bottom layer having an extra kick of soya sauce flavor. This cha-su is a winner. 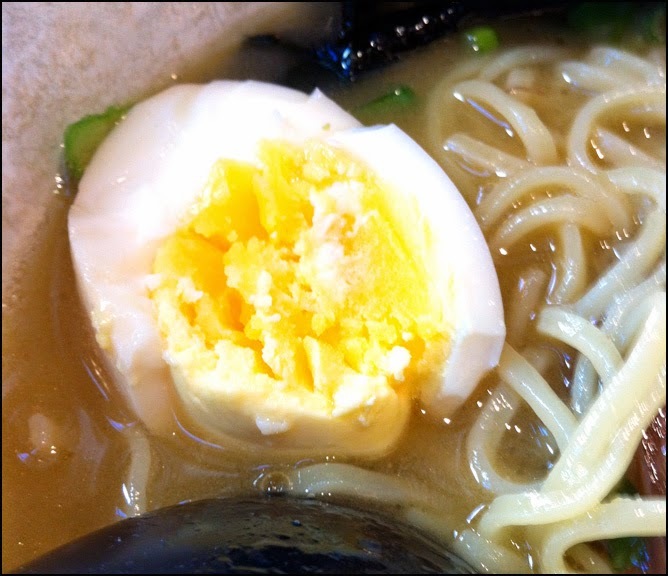 Much like Marutama, what will divide ramen aficionados is the soup. It’s quite syrupy for a ramen soup stock. It’s not as thick as gravy but reminds me of a demi glaze; easily coating my heavy ceramic soup spoon and has a similar sheen. I actually thought it was neat to see two tones of colour emerge when I swirled my spoon in the soup and the green onion garnish suspended in the liquid, instead of sinking to the bottom or floating on top. The flavor of the soup is complex and rich derived from the use of both chicken and pork meat. It has a strong umami taste, with a bit of a cartilage/tendon/sinew aftertaste. The flavor of the soup is good but not unique. I feel it tastes similar to Jinya’s rendition. For some, the thicker consistency of the soup will be off putting. However, I enjoyed it and saw how Taishoken’s soup would be a strong foundation for their Tsuke-Men offering. With it’s rich soup and fatty pork belly cha-su, I felt the size of the my shio ramen was perfectly satisfying, without causing indigestion and general lethargy. A few days later I returned to try an unusual ramen I had spotted on the menu: the Tomato Ramen. The bright red concoction is inspired by Italy. The regular version has a tomato soup stock, ramen noodles, raw white onions, dry Italian seasonings, Parmesan cheese and your choice of cha-su. For the sake of comparison I went with the Pork Shoulder cha-su. Although seasoned well, it definitely had a much more intense pork flavor in contrast to the pork belly cha-su. The meat was also much tougher but like I said if you’re health conscious it’s not a bad way to go. However my preference is definitely the pork belly cha-su. For the soup, I think they simply added canned diced tomatos to their regular chicken and pork stock. As a result, the soup for the Tomato Ramen was not as syrupy. I actually really like the red soup, as the sharp tangy tomato flavor helped mask the cartilage/tendon/sinew aftertaste. Another component that work was the flavor of the cheese. It added another layer of umami to the dish. I wish they had dispersed the cheese a little more evenly so that more bites of noodles would have cheese in it. Unfortunately they only clumped a small pile in one area and the cheese ended up melting onto my spoon as I tried to spread it around. In contrast, the raw onions and dry Italian season were a little less successful. I didn’t enjoy having intense onion and oregano flavor randomly and boldly inserting themselves into my bites of food. This was so off putting that I probably would not order the Tomato Ramen again. However I would consider asking them to substitute the tomato soup for the syrupy pork and chicken stock in their other regular ramen from time to time. I would definitely return frequently to Taishoken for the delicious and wonderful pork belly cha-su. I’m also excited to try their Tsuke-Men on my next visit, as it was available and on the regular menu on my second visit.